The southwest corner of 84th Street and Central Park West in New York will now be known as Elie Wiesel Way, honoring the Holocaust survivor, Nobel Peace Prize winner and celebrated author a year after his death. A moving ceremony to unveil the co-naming of the street on Tuesday was attended by dignitaries including New York Mayor Bill DeBlasio and members of the Wiesel family. 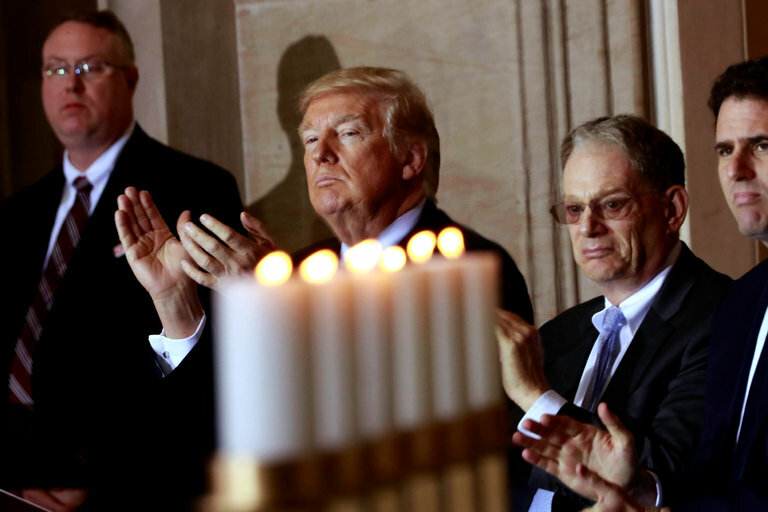 This morning, I listened to President Trump give a speech, and I was shocked to hear him mispronounce so many well-known words, regarding the Holocaust. For example, Trump mispronounced the word Nazi. He said Nozzy instead of Not-see. Then he mispronounced the name of the most famous person who ever claimed to be a Holocaust survivor, but wasn’t: Elie Wiesel. Trump mispronounced Wiesel’s first name as Elly, instead of E-lee. The way that Trump pronounced “Elly”, it rhymed with Smelly and Jelly. He mispronounced the word Wiesel as Weasel, instead of Vee-zel. Near the end of his speech, President Trump told the story of Gerda Klein who claimed that she had been held by the Nazis in a prison in Poland for 3 years. Trump did not give the name of the prison, so that we could look it up. Gerda claimed that she was liberated from Dachau by American soldiers. That day was Gerda’s 21st birthday and she weighed 68 pounds, according to the story told by Trump. I wrote my website many years ago — in 1998, and at that time, I had never heard the story of Gerda Klein. So I do not believe her story. Trump should have given some proof of this story. It is strange that I never heard about Gerda Wiessmann when I was studying the liberation of Dachau. I blogged about Gerda before on the link below. Arutz Sheva spoke with Elisha Wiesel the son of Holocaust survivor and Nobel laureate, the late Eli Wiesel. Wiesel was in Krakow, Poland, to participate in the annual March of the Living Holocaust commemoration. “To see this cemetery, and to see a thousand years of Polish Jewry, and some of the great names that are buries here, you remember that it’s not just that there was a death here in Poland. There was a life for Jews here, before, in Poland,” Wiesel said. There is a video of Elie’s son as he tours a famous cemetery. When I saw the video, I recognized the stones in a famous Jewish cemetery which I had visited, many years ago. The photo below shoes the entrance into this famous Jewish cemetery. “HAND in hand we followed the crowd. An SS non-commissioned officer came to meet us, a truncheon in his hand. “Eight words spoken quietly, indifferently, without emotion. Eight short, simple words. “Yet that was the moment when I parted from my mother. Those are the haunting words of Elie Wiesel, a survivor of the Holocaust who, as a young boy, was taken to the notorious Auschwitz-Birkenau concentration and death camp. One million Jews, 64,000 Poles, 21,000 Sinti and Roma, 15,000 Soviet prisoners of war and around 12,000 victims of other groups – murdered. Who were these people? How did such a crime against humanity happen? How many others had to turn their heads or willingly collaborate in the process? And how do we ensure that in the future, the mantra ‘never again’ becomes more than just words? These were just some of the questions going through the minds of 200 students from across the South West last month as they stood on the same spot where Elie Wiesel had been so cruelly parted from his mother more than 70 years ago. Are there no fact checkers on newspapers any more? My first job on a newspaper, after I had graduated from Journalism school, was to check the facts in every news story before the paper went to press. It was my job to yell “Stop the press” if I spotted a serious error. This is a serious error because Elie Wiesel finally admitted, just before he died, that he was never in any camp. He was hiding out in his home town, when the Jews were sent to camps. Elie always refused to show his non-existent tattoo. The lack of a tattoo is proof that he was never in a camp. Why were Elie and his father spared? The motive in sending the Jews to Auschwitz was to exterminate them with bug spray, known as Zyklon-B. What was so different about Elie and his father? Why weren’t they killed? So Elie was in a “French orphanage?” Is that where he met some young survivors of Auschwitz who had been sent to France after Auschwitz was liberated? Did he get his Auschwitz story from these young boys? I think that he did. There is a website at http://www.eliewieseltattoo.com/ which devoted to exposing the lies told by Elie Wiesel.